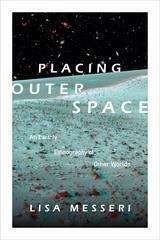 In Placing Outer Space Lisa Messeri traces how the place-making practices of planetary scientists transform the void of space into a cosmos filled with worlds that can be known and explored. Making planets into places is central to the daily practices and professional identities of the astronomers, geologists, and computer scientists Messeri studies. She takes readers to the Mars Desert Research Station and a NASA research center to discuss ways scientists experience and map Mars. At a Chilean observatory and in MIT's labs she describes how they discover exoplanets and envision what it would be like to inhabit them. Today's planetary science reveals the universe as densely inhabited by evocative worlds, which in turn tells us more about Earth, ourselves, and our place in the universe.